Solidaritas Perempuan (Women’s Solidarity for Human Rights) is a feminist organisation established in 1990 based on individual membership. As of June 2014, SP had 686 members (men and women) across Indonesia. At their sixth Congress in Palu, 2012, SP was mandated to strengthen and develop the grassroots women’s political movement against impoverishment. This translated into the four interconnected issues at the heart of Solidaritas Perempuan’s work: women and conflict over natural resources (including climate change); women and food sovereignty; women, migration and trafficking; and women and the politicization of religion. The interconnected issues are based on SP’s analysis that when women lose access and control over natural resources, especially over decision making processes, one of the impacts is that they also lose their control over food resources. This means that they lose their sovereignty over food, including food chain management. This also prompts the need for cash so they can buy the goods they can no longer produce or access. Large scale commercial exploitation of natural resources and industrialization has meant prolonged impoverishment for grass roots communities, particularly women. These forces have also become the push factor for people to find alternative ways of earning income and deciding to migrate and work abroad, when jobs are no longer available for them within the country. 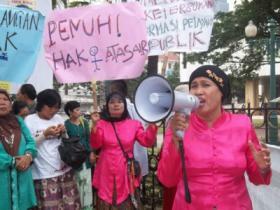 There is a high demand for Indonesian domestic workers. This kind of work is embedded in gender norms as ‘women’s work’ or attached to women’s gender role: ninety percent of migrant workers are women (see box). This has resulted in the feminization of migration. The politicization of religion is linked to these interrelated problems, because it is concerned with women’s rights to have control over their own bodies and minds. The patriarchal (social) system then uses religion to limit these rights, and to discriminate against and intimidate women. All of which helps to keep women marginalized from the decision-making processes – including decision-making about natural resources and food management - which affect their lives. Women’s rights have become further limited with the introduction of 342 discriminatory regulations and violent practices carried out in the name of religion. While some women migrant workers are able to build security by working away from home, in many cases they lose out by entering the migrant worker market. Sometimes families (whether unwittingly or not) enter into exploitative contracts with agencies or brokers. This is part of the commodification of women migrant domestic workers. Women, sometimes at a very young age, may be effectively reduced to property ‘bought’ as raw material, processed in a training centre, and then marketed and sold to consumers. There have been many cases documented of women migrant domestic workers being abused by their employers, or their rights being violated, with no protection mechanism and nowhere to turn for help. SP has worked to strengthen and organize women migrant workers and their families in seven regions of Indonesia, and has handled and documented numerous cases involving women migrant domestic workers. See http://www.solidaritasperempuan.org/publikasi/koleksi-buku/). Most of these cases involved physical abuses, sexual abuse, non-payment of workers, having to work longer hours than stated in the contract or trafficking. Dreamseekers, a recent film about Indonesian migrant workers in Hong Kong portrays the traumatic impact on abused young women very well, but also explains the debt entrapment system that supports this trade. This is a situation which can radicalize women as they become aware of the gender injustices that led them into a position where they were vulnerable to exploitation. However, migration – especially to jobs overseas where there may be additional language and cultural obstacles facing them, means that women can also become isolated, vulnerable to abuse and rights violations, and in many cases indebted to the agencies whose fees for training and travel must be paid off – a process which may take many months or even years. On the issue of women and natural resources, SP has been working on women’s access to, and control over, natural resources, in particular in the area of forestry, large-scale plantations, mining, water privatization and climate projects for the last three years. The work springs from the communities’ own priorities. SP has 10 communities/branches: SP Bungoeng Jeumpa Aceh, SP Palembang (South Sumatra), SP Jabotabek (Jakarta and nearby), SP Kinasih (Yogyakarta), SP Mataram (West Nusa Tenggara), SP Sumbawa (West Nusa Tenggara), SP Anging Mammiri (South Sulawesi), SP Kendari (South East Sulawesi), SP Palu and SP Poso (Central Sulawesi). Most of them have taken up natural resources as their issue except Mataram and Yogyakarta which are focusing on food and religious politicization. SP also works in 4 regions: Lampung, East Java, Central Kalimantan and West Java. In Central Kalimantan, SP is monitoring the (now-defunct) Australia financed REDD demonstration activity project, the Kalimantan Forest Carbon Partnership (KFCP). Related to this, SP is also focusing on empowering the women living within the project area. The REDD+ Demonstration Activity in Ulu Masen, Aceh, whose status is also unclear. On climate change, besides advocacy on REDD+, SP is also working on monitoring climate finance and the international financial institutions involved, such as the Forest Investment Program (FIP) funded by the World Bank, IFC and ADB and the newly established Green Climate Fund, (the UNFCCC’s global fund to mitigate and adapt to climate change) which is starting to build its policies and mechanisms. SP’s other main strategy is policy advocacy: the group is currently pushing for the adoption of a Gender Safeguard it has drafted in Indonesia’s national-level climate change policy. The main principles of the Safeguard has already been adopted as part of the Principles, Criteria and Indicators (PRISAI) for the national REDD+ Strategy, which are gender inclusive, sensitive and responsive principles. As well as the Gender Safeguards work, the organization is working with KPPPA (the Ministry of Women’s Empowerment and Child Protection) to boost the ministry’s involvement in natural resources issues. For example, SP has encouraged KPPPA to join the National Council on Climate Change (DNPI). SP together with KPPPA and several institutions/organizations, is also working to push for gender mainstreaming through the National Long Term Development Plan, including gender responsive budgeting. “Because if gender issues are not included in budgeting then it will be difficult to mainstream gender issues in the internal government,” says Aliza. With others, SP is also pushing for a more just government, which sets women’s empowerment and protection as main priorities. SP is doing this through several CSO movements, such as Indonesia Beragam (Diverse Indonesia), a coalition of women’s organizations and several other networks, consisting of many organizations focusing women and gender issues. Before the elections, SP also issued a statement calling on the next president to stop the commodification of nature in Indonesia (see statement). Now that the elections are over, what does SP think about the future for women in Indonesia? “Women must participate and get involved in all decision making processes and in all aspects of these - social, political, economic and cultural - and they therefore need to have access to information and control over decisions, to empowerment, and to safeguards based on gender inclusive, sensitive, and responsive principles ”. says Puspa Dewy, Program Coordinator of Solidaritas Perempuan’s National Executive Body. Many women are involved in taking action or demonstrations now, explains SP, but how exactly are they involved? Too often women are placed in the vanguard or the frontline, but it is the men who usually do all the strategizing, directing or organizing of protest actions; women also cook, make coffee and food during the discussions. It’s fine to have a division of roles but do the women agree to that division? Were they even involved in discussing it? Do women believe that they are involved?